After analyzing hundreds of Amazon reviews, we’ve chosen ten of the best electric ukuleles for your consideration, plus we’ve assembled some tips for choosing an electric ukulele that will meet your needs. 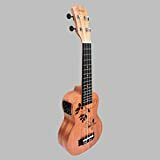 Our Top choice is the Official Kala Learn to Play Ukulele Starter Kit, Light Mahogany ukulele with a Pack Bundle with Gig bag Online Lessons, Tuner, and App. While it’s true that looks aren’t everything, the Epiphone Les Paul acoustic / electric ukulele is an attractive instrument that consistently meets players’ expectations. 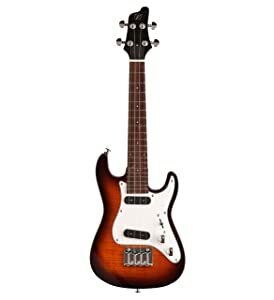 It’s got a classic cutaway profile that makes for easier access to the entire fretboard, and it comes in your choice of beautiful Vintage Sunburst or Cherry Burst finish that makes for a fantastic presentation onstage. The solid neck is screw-joined to the body, which is crafted of solid wood and finished in a flawless lacquer coating. Metal frets, good quality tuners, and a chrome-metal amp jack impart functionality while providing a bit of visual contrast, and the head sports Epiphone and Les Paul stamps for even more appeal. A gig bag is included for your convenience. The instrument is beautiful and well-made, particularly considering the low cost; it’s a nice little uke for the price. This ukulele has a pleasant tone and sounds best when amped; when used acoustically, it has a “plinky” tone. Has all the quality that Epiphone always delivers. The strings are stock; you’ll probably want to replace them with higher quality ones. While the sound is crisp and clear, there is no volume or tone control. Aside from the passive electronics, this is a prime instrument. Cordoba makes quality instruments, so we weren’t a bit surprised with how well this beautiful electric ukulele plays. With a mahogany top, back, and sides, plus a satin modern edge burst finish, it looks just as good as it sounds. The pickup has discreet sound hole controls, meaning your stage presence is somewhat enhanced, and the full, rich sound is sure to appeal to your senses. An abalone-style rosette and silver tuners with pearl buttons add to the instrument’s classic appearance. Premium Aquila strings are included with the Cordoba 15CM-E ukulele. This ukulele has a crisp, clear ring when you fingerpick or strum, and intonation is spot on. The instrument has a flat back, meaning the sound isn’t quite as rich as that of a ukulele with an arched back. Relatively inexpensive, but offers a good, reliable performance once the strings have been broken in. The tuning pegs are well-made and the uke stays in tune almost effortlessly. The instrument is great, more than I expected for the price with good quality materials and finish; it is good looking and sounds great. The nut and saddle are made of plastic, not bone like on higher end ukes. Replacing them with a bone nut and saddle when changing the strings might improve the tone. A gorgeous sunburst finish, distinctive neck shape, and a classic cutaway Telecaster body make the Fender ’52 ukulele a popular choice. A spruce top with tone bar bracing provides crisp, clear tone that makes this ukulele a standout and a pleasure to play. An onboard electronic tuner, a Fishman Kula preamp, and premier components including a mahogany neck, aged white binding, and a rosewood fingerboard make for an outstanding playing experience. This instrument plays well right out of the box, even though it sounds better after the strings break in (this takes about two days). The frets are well-set and finished, and the action is just right. 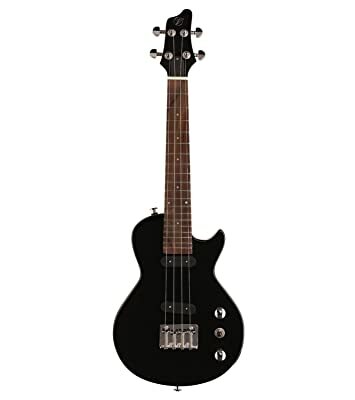 The instrument is advertised with black strings but it came with white Aquila nylagut strings; it’s personal preference but I’ll be switching to the black strings for a mellower tone. Maybe I got a lemon, but the C string has a malfunctioning peg. This little uke puts out some great sound, and the Fender headstock is great since all the tuning pegs are in a row. My husband is a long time guitar player who struggles to put this ukulele down; he says it is just so fun to play and musically liberating. 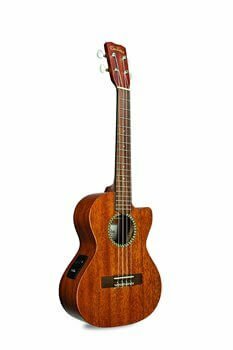 Made of beautifully grained mahogany, this tenor ukulele features a soft cutaway that offers a distinctive appearance while making it easier to play. A rosewood bridge and fingerboard provide a bit of contrast, while a satin finish lets the wood’s natural beauty shine through; a herringbone rosette completes the look. With a 2Band EQ pickup, gold and pearl tuning machines, and Aquila nylgut strings, this instrument offers a full, rich sound. The tenor size is easy to play, and the cutaway design keeps hands more comfortable. The Cordoba 20TM-CE acoustic-electric ukulele costs a little more than some others, but it gets outstanding reviews on a consistent basis. Love the uke’s sweet, warm sound, and it projects fairly nicely. The cutaway makes this ukulele extraordinarily easy and comfortable to play. Players who prefer a bolder, bigger steel-string guitar-like sound might find this too mellow for their liking. The geared tuners stay nice and tight. There is no cord included for plugging in to an amp; you have to get your own standard ¼” jack-plug plus a 9V battery for the pickup. Unbelievably good for the price, excellent especially for intermediate players and above. Kala has a reputation for building fine ukuleles, and we were definitely impressed with this one. Its mahogany body and neck are finished in a warm, reddish brown tone, with a rosewood fingerboard and bridge for pleasing visual contrast. The satin finish feels fantastic and really shows off the mahogany’s natural beauty. This is the best-sounding concert ukulele I’ve tried for under $300. The ukulele’s electronics work perfectly and the tuner is spot-on. Maybe I’m picky, but there was a little bit of excess glue at the neck that shows under the finish. The packaging was pretty flimsy, with stress marks inside; luckily the ukulele arrived in good condition. Excellent tone quality, sturdy build, and absolute gorgeousness right out of the box. This is a gig-worthy ukulele, it looks and sounds awesome! Designed for easy playing, this ukulele offers the same notes (E, A, D, G low to high) as a standard bass guitar. A gorgeous mahogany body contrasts beautifully with the rosewood fretboard and the white Aquila nylgut strings. The Hadean acoustic electric bass ukulele includes a preamp for amplified use with bass, mid, treble, and volume controls, along with an integrated tuner for added convenience. A back trapdoor makes for easier restringing. Incredibly crafted and a great sounding instrument. I can’t believe it was this economical. This ukulele is fun to play and it produces a big sound. The big, thick rubbery strings take some getting used to. It takes some practice to mute the strings after you pluck them. Aesthetically pleasing and fun to play for sure! The rubbery strings are easy on your hands and they stay in tune pretty well. The built in tuner is a nice feature. Available in black, flame maple, or quilt maple, the Vorson FSUK1BK Style electric ukulele offers a unique appearance that appeals to new and experienced players alike. The electric guitar style body features two cutaways for easy access to the neck, making it easy to grab even the most complicated chords. The contrasting neck and fretboard are a nice touch, and dot markers allow newer players to hit each note with a bit more ease. This electric uke comes with dual single oil pickups that provide an outstanding ukulele tone with plenty of variation thanks to a 3-way toggle and tone control. A padded gig bag and cable are included for your convenience. The ukulele came out of the box all set up and ready to go. Good action, nice finish, and outstanding playability. The steel strings that come with this uke aren’t the greatest but can be replaced with better ones. The strings were horrible, I changed then and used an Allen wrench to adjust the saddles and that made all the difference, no more buzz. This was a great buy, plus the uke sounds good and is a lot of fun to play! If you’re familiar with Stratocaster guitars, you will appreciate the taper on the top and the contour comfort cutout on the back side, it’s great quality for the price plus it’s fun to play metal licks on the uke! A laminated spruce top with a delicate hummingbird design, an Okoume neck, and a rosewood fretboard make this a beautiful instrument. Like many others in this category, this Kmise electro-acoustic concert ukulele plays nicely whether it’s plugged into the amp or left unplugged. A built-in tuner adds convenience; an LCD screen, Volume control, and Equalizer System are also onboard. This ukulele arrives pre-strung with Aquila strings. The quality is very good, especially for this price. The amp and tuner both work well. The artwork looks nice from a distance, but up close the markings aren’t as clean as they could be. There was a buzz problem at first that ended up being the wiring from the tuner / pickup touching the inside of the uke. Easily fixed and now it’s fine. Wonderful little instrument that’s easy to play and sounds nice! Well-made with good intonation, making this a high-quality inexpensive uke with great sound. 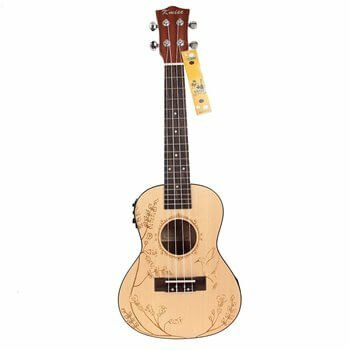 With a mahogany body, beautiful butterfly graphics on its front, the Caramel CS400 Mahogany Butterfly soprano acoustic electric ukulele boasts a contrasting rosewood bridge and fretboard, plus it comes pre-strung with Aquila strings. It represents a little step up from a basic soprano ukulele, thanks to onboard electronics including 3 band EQ controls (bass, middle, and treble), a chromatic tuner with an LCD color display screen, and a convenient low battery indicator. This is a great little ukulele, especially for the price. You’ll have to buy batteries and a cord since they don’t come with the instrument. Some of the frets were sharp and hurt my fingers. I used a little bit of fine-grain sandpaper and that fixed the problem. Price, features, and quality make this a great choice for a first ukulele. The front graphics are beautiful, I’m surprised this uke didn’t cost more! 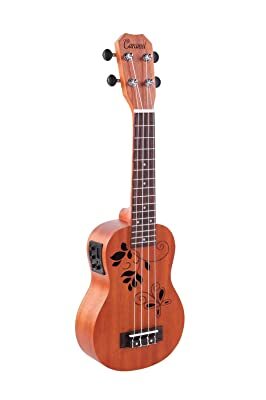 A uniquely styled tenor ukulele that offers the look of a classic electric guitar, the Vorson FLPUK2BK electric ukulele features a cutaway body. It comes complete with a gig bag, and it offers nice electronics that make playing a pleasure. The black candlenut finish is fantastic; flame maple and quilt maple are other options. We appreciated the full, rich sound just as much as we enjoyed the aesthetics, and the adjustable truss rod and bridge made playing a breeze. I am super impressed with this uke, it is beautiful, solid feeling, and sounds amazing! For the price point, this ukulele is a steal! It is endless fun for newbies and pros alike. The steel strings on this uke are cheap, leaving black residue on your fingers. I am happy now that I replaced them with better ones. Maybe it’s just me but I didn’t like the re-entrant high G tuning that comes with this Uke. I replaced the high G string with a low G string and now I love the way it sounds. The 3-way pickup selector allows for a nice variety of tones! It’s a lot of fun to add a pedal and play that way. Solid and well-built, unless you’re an acoustic purist you should go for it and give this uke a try. Electric ukuleles can be electrically amplified, and come in the same four standard sizes (soprano, concert, tenor, and bass) as acoustic ukuleles. Some electric ukuleles offer unique sizing and style features, while others look almost identical to their acoustic cousins. Here are some things to look for when making your choice. Mahogany, Spruce, and Maple are among the most popular woods used by electric ukulele manufacturers, and all are high-quality. The wood or laminate used to build the ukulele impacts the way it sounds, as well as its longevity and performance over its lifetime. Choosing a low-quality wood, laminate, or even plastic means you’ll pay quite a bit less, but it can also mean problems with pitch, tone, and stability. A cheap ukulele isn’t normally a good investment – and since these poorly made instruments don’t sound very nice, they aren’t as much fun to play as better-made versions. Ukuleles typically come in four sizes with soprano, or “standard” ukuleles being smallest. If your hands are large, you may find it easier to choose a larger instrument, but children will normally find soprano ukes easy to play. The “Concert” ukulele is a few inches larger, and as it offers a richer sound it is very popular. Tenor, the next size up, is a favorite for its versatility, and baritone or bass, the largest ukulele, has the richest, deepest tones. You may want to listen to some clips of each ukulele playing if you’re having some trouble deciding on size. If you listen to the way these ukuleles sound, you’ll notice that there is a difference. 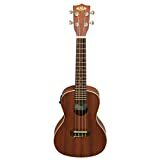 Solid body ukuleles (electric only) produce little sound unless they are plugged in, just like electric guitars. Electric/Acoustic ukuleles can be enjoyed plugged in or un-amped, and will typically produce a classic ukulele sound depending on size. Check to see whether the ukulele you choose has volume control, equalization, and/or an onboard tuner. These are just a few options. The pricier your electric ukulele, the more electronics it’s likely to have, and the better quality they will be. As you’ve seen from our reviews, you can get a decent electric ukulele for less than $100, and mid-range ones don’t cost more than about $200. If you are ready to step up from a basic instrument to one that you can play in front of an audience, then you might want to pay a bit more – but shop around! 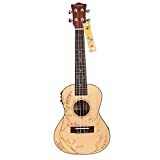 You don’t have to pay hundreds or even thousands of dollars to get a decent electric ukulele that you’ll enjoy playing. If you want to invest more, you’ll find some exceptional instruments beginning around the $350 mark.